10 000 year explosion, altruism, biology 101, biology and behavior, biology matters, different peoples is different (duh! ), england, english, europe, europeans, general theory of the west, inbreeding, inclusive fitness, kissin' cousins, mating patterns matter, medieval europe, relatedness matters, steven pinker, violence, violent behavior, what's this hbd business all about anyway? i’ve pretty much finished reading pinker’s The Better Angels — i’ll admit to you right now that i skimmed chapter 8, “Inner Demons,” so i’ll have to go back and give that a proper read — and i’ll also say right now that it’s an amazing book! definitely worth a (full and attentive!) read. and i agree with steve sailer that pinker is really, really thorough and covers everything you could imagine that might be related to violence. pinker is obviously no blank slater, so he knows that evolution has shaped human behavior. but, at least as far as i could see, he doesn’t give much cred — not in this book anyway — to the fact that different populations might differ in average behavioral patterns including violence — differ because of their different evolutionary histories. recent evolutionary histories. pinker seems to be hooked on the idea of human nature rather than human natures, and that’s too bad. the 1300s to pinker’s humanitarian revolution (basically the enlightenment) of the 1700s? that’s four hundred years right there — plenty of time for evolution to have happened (see also here for example [pdf]) — especially if the selection pressures for these more soft and squishy, as opposed to nasty and brutish, behaviors had been there. which i think were, thanks to the roman catholic church’s bizarre requirement that catholics outbreed — a practice that medieval nw europeans seem to have jumped upon with (comparatively) great enthusiasm (see “mating patterns in europe” series in left-hand column below ↓) — eventually anyway. furthermore, while the anglo-saxons in england were still marrying their cousins in the 500-600s, to the dismay of st. augustine (the one who went to england), my guess is that their outbreeding project was probably well underway by the 800s thanks to pressure from the church and secular authorities (e.g. see first note here). definitely by 1000 to be really conservative. so the evolutionary time period we’re talking about is probably actually seven hundred, or even nine hundred, years long. p-l-e-n-t-y of time for natural selection to have worked its magic. what were these selection pressures that resulted in nw europeans going all soft and squishy? well, because of the church’s various bans on close marriages (which were also backed by many nw european secular authorities), the degree of genetic similarity between close and extended family members in nw european populations was reduced, so inclusive fitness payoffs were similarly reduced for these populations. since there was no longer sooo much to be gained genetically by helping your second-cousin-once-removed, clans — and clannish behaviors — disappeared in england and other parts of nw europe. being successful in life — and, most importantly, reproduction — thus depended more on your alliances with neighbors and friends rather than your extended family. and it was these behavioral patterns — along with gregory clark’s bourgeois, middle class traits — that were increasingly selected for in nw medieval european populations. more and more over the period, it paid off less and less to be brutal and cruel to your unrelated neighbors — why would anybody cooperate with you if you were brutal and cruel to them? — so eventually nw medieval europeans chilled out. they became more individualistic — and universalistic in their thinking/sentiments. until — voilà! — we got the enlightenment. which DIDN’T happen anywhere else but in nw europe — where people had been outbreeding (relatively speaking) for several hundreds of years. even if i’m wrong, which is impossible pretty likely, it remains a fact that this pacification process started in nw europe, really with the english, and not anywhere else in the world (except maybe in some pockets here and there). and THAT requires explaining — which i don’t think that any of pinker’s social, cultural or rational explanations do. why england? why nw europe? what was so different there? ← Previous Post happy thanksgiving, 2012! I have only read The Blank Slate. It was obvious that Pinker would avoid racial differences as much as he could. Actually his thorough and preventive counterarguments suggested that he knew precisely the implications of his ideas. I guess he thought he should choose his battles wisely [but maybe I am just too lenient towards him – he seemed somewhat fine with many egalitarian ideas…]. not exactly, i don’t think, but i’m not entirely sure because i haven’t read as much about japan as i have about england/europe. i’m pretty sure that the japanese have a more recent (i.e. longer) history of greater inbreeding than the english or some other nw europeans. Nassim Taleb wrote a criticism of Pinker’s thesis. He wrote a short essay called “The “Long Peace” Is a Statistical Illusion”. Don’t worry. Pinky ain’t a lost cause. oh, good! and that would make sense ’cause he’s certainly not a stupid guy. thanks for the links! The difference here, or part of it anyway, I think, is between the time it takes new mutations (allels for lactose tolerance for example) to spread — which is what Pinker is referring to — and the time it takes to shuffle the genes that distinguish one family/clan/tribe from another through interbreeding (or outbreeding), which is what this blog is about. It would be nice if we had nifty terms that make this distinction. what i think we are looking at — or should be looking for — are different frequencies of genes (alleles) related to social behaviors in different populations, not just “the genes that distinguish one family/clan/tribe from another,” although maybe those, too. for human biodiveristy to exist, you don’t need to start from scratch from new mutations spreading through one population or another. you can just alter the frequencies (enough) of alleles that maybe all populations share to some extent or another. This paper by Harpending & Cochran illustrates quite nicely how cad/dad societies may differ in respect of violence. “Because the prominent phenotypic effects of 7R are in males, we need to ask what is the niche in human societies for males who are energetic, impulsive (i.e., unpredictable), and noncompliant? Whereas tests of hypotheses ought to be careful and conservative, generation of hypotheses ought to be speculative and free-ranging. There is a tradition of caution approaching self-censorship in discussions of human biological diversity, but we will break that tradition in what follows…. But the advent of gardening technology freed males from subsistence work and, in the new social environment of display, aggression, and male coalitional violence bearers of 7R may have flourished, accounting for the evidence given by Ding et al. (3) of the recent increase in frequency of the allele. Finally, as polities emerged that suppressed the system of local anarchy, population growth occurred, land became scarce; agriculture became more labor intensive; and men were again forced into work to provision their families. The archetypes in the literature of anthropology of dad hunter-gatherers are !Kung Bushmen of southern Africa; the archetypes of labor intensive farmers are east Asians; and the archetypes of local anarchy are Indians of lowland South America like the Yanomamo. It is probably no accident that two of the best known ethnographies of the twentieth century are titled “The Harmless People,” about the !Kung who have few or no 7R alleles, and “The Fierce People,” about the Yanomamo with a high frequency of 7R. Peter Frost’s piece on genetic pacification probably came out a bit too late for “Better Angels”. Similar argument to Clark. No, he’s certainly not a stupid guy. I think the key thing in the decline of violence in the (northern?) civilized world is State monopoly on violence: obviously, as Europe demonstrates, the inbreeding/outbreeding thing played a role, but East Asia, particularly China, demonstrates that you can attain pacification despite heavy amounts of inbreeding. What you need most is a strong State. Couple that with internal population replacement ala Gregory Clark, and you end up, in time, with a country full of well behaved people. I think the key thing that makes the difference in Europe (vs E. Asia) is that, since the fall of Rome, you don’t have a mighty empire enforcing its will across the land; the land remained fractured into regional polities, where clans and their big wigs could have been large and in charge. In that type of area (i.e., Scotland/Wales/Ireland, Southern Iberia, Southern Italy, Eastern Europe) State pacification was probably inefficient, or at least less efficient than it was in “core” Europe, enough to generate a pattern that correlates rates of violence with outbreeding. The limited penetration of the manor system into these areas was likely a big part of this. One question to think about is what, exactly, is the dependent variable? Pinker uses the word “violence,” but I think he’s often talking about multiple things: the Manhattan Project was engaged in violence, but the traits that made them good at vaporizing cities are different from the traits that lead to the Rodney King riots. I suggested “disorder,” but even that might be too inclusive. Obviously I’m having a hard time getting my head around this particular possibility! :) I’ll work on it. Incidentally, regarding the frequentist argument with respect to familial atruism and reciprocal altruism, have any of the “giants” in the field made this argument? One thing I’ve learned in my recent reading-up-on-China binge is that historically there has been quite of lot of inter-clan violence in China up to and including clan genocide; there’s also been a good deal of intraclan violence. China has never been a well governed or fully pacified society. Not by a long shot. I’ll try to come up with some specific references if you want them, but these phenomena are constand and widespread throughout Chinese history. don’t think so. i agree, a strong state is important and can do a lot (i.e. to simply eliminate a lot of individual baddies from the population, for instance), but the whole pacification process works a lot better, i think, if you actually pacifiy the entire population as much as possible. china has achieved a great deal of pacification, but they require a very repressive state — to this day. i think this is because the population is still driven too much by those sentiments connected to clannishness (see luke’s comment above). the anglos, otoh, can function peaceably with very minimal government — even self-government! that’s because the population is much more chilled out. so, i agree with you (and pinker) to an extent — a strong state is very useful — but it’s even better if you can work with a population that is chilled out. i think i had homicides at the forefront of my mind most of the time while reading through the book, even though i realized pinker was talking about a whole bunch of other stuff, too. but i also kept (keep) grouping the medieval european homicide rates together with, for instance, the yanomamo or semai inter-clan “warfare” death rates, and they’re maybe not the same thing. then again, maybe they are related: the yanomamo have continually high inter-clan “warfare” death rates because they’re clannish, but the medieval english homicide rate declined over the period — and those killings were not, i don’t think, clan-based since the english were no longer clannish at that point. still, yeah — are homicides/inter-clan killings comparable to wwi and ii? dunno. I agree with this. I’ve spoken with several Chinese from the countryside, and they seem to universally opine that 1) the clannish village people get into a lot of family-violence, and 2) they simultaneously keep a lid on it, and minimize attention to it from the state. There’s a frequently used Chinese “chengyu” idiom, which goes the mountains are high and the emperor is far away. It summarizes aptly what happens as soon as the police is either absent, or can be bribed to look the other way (as is almost universally the case). mind you, i was flying through frankfurt airport once, and going through security there was only one out of three x-ray machines in operation. i have just enough german that i understand understood [edit: apparently i don’t have much engrish, tho!] a german man behind me complaining to his wife that the situation was “typical german.” ah ha!, i thought — even the germans complain about what they perceive to be their own inefficiency! (^_^) never mind that the whole country runs like clockwork otherwise…. On the Marshmallow test, I recall that they scored nr. 1. In the spirit of your self-policing, source-hunting lead. (^_^) but it’s easy. you already know how this works (i’m pretty sure) — i think you’re just over-thinking it. take the example of the drd4 genes (alleles) that kiwiguy mentioned above. there are different variations (alleles) of the drd4 gene, right? : 2 repeat, 4 repeat and 7 repeat. the 7 repeat has been maybe/possibly associated with adhd. anyway — the frequencies of each of those alleles varies in different populations around the world (map) — east asians have a low frequency of the 7 repeat allele, while native south americans have a high frequency of it. the point is, all of the populations possess all three versions of the gene, just at different frequencies. none of the populations has just one or two of the variations while missing the others. now just replace the drd4 gene with “gene(s) for familial altruism” or “gene(s) for reciprocal altruism.” same thing (at least, that’s the theory). human biodiversity doesn’t have to mean all or nothing (like lactase persistence). populations can differ in the frequencies of certain genes, not just their presence or absence. not that i’m aware of — not exactly anyway (see below) — but i haven’t read all there is to read about altruism in humans. i’ve seen discussions/theorizing/etc. about altruism, of course, and reciprocal altruism, but i haven’t seen anyone refer specifically to what i’ve dubbed “familial altruism” — i.e. those behaviors related to favoring one’s extended family/clan over non-relatives in an almost exclusive, and often hostile, way. and i haven’t seen anyone suggest that “familial altruism” and “reciprocal altruism” might be kinda opposed to one another. so, outbreeding reduces altruism — in hamilton’s thinking — while barbarian societies, presumably he thought they would be more inbred(?) — not panmictic anyway — don’t lose their altruistic traits in the same way. once it’s noted that pinker is m.o.t., much obfuscation and elision become clear. I meant in an evolutionary sense, of course. :) I suspect that the culling of violent individuals by the State removes some of the genes for violence in the population, ultimately rendering it more peaceful. Inbreeding, and hence clannishness, can interfere with this process, because while the State is selecting for less violent people, clan conflict presents a counteracting selective pressure for people who are more violent (and can fight feuds). While true, East Asians are, overall, a lot less violent than say Arabs, and are roughly comparable to Europeans. Internal population replacement ala Greg Clark (promotes bourgeois values including restraint and future-time orientation—probably works best in cold climates). You can get a reduction in genes for violence in a population over time with any one of these, but the more you have, the faster it happens, and some of these allow the development of the others (e.g., strong states and especially organized states are likely to form in outbred populations). The rapid drop in the homicide rate in Scandinavia a few centuries ago is likely the result of the relaxation of selection for violent individuals thanks to the end tribal warfare, itself thanks to the adoption of outbreeding. This allowed the other two factors to quickly alter the population. Pinker’s a very smart guy who has a very strong impulse to tell the turth, but he’s not going to charge out there and get Watsoned at this point in his career. In the meantime, he has shoved the window of acceptable discourse over a bit towards realism. I suppose that we should be grateful for that. oh, yes! i understood that. (^_^) don’t mind me — it was late when i was writing so i wasn’t very clear (that’s my excuse anyway! (~_^) ). very interesting! i think you’d find those attitudes/that situation in many clannish places. Yes i think there’s a general pacification process that results from civilization (aka high population density farming) comprising a mixture of state culling of the violent and downward population replacement a la Farewell to Alms. This will hava rate p *per century* it is applied. So countries like China where it has been going on a very long time will have very high levels of pacification – at least along the main river-valleys if not in the surrounding mountains. Fujian is the low IQ province in the centre of the IQ donut shown on the map here created by the two big river vallies leading to Hong Kong and Shanghai. Then on top of this there’s either the inbreeding / outbreeding effect on top of that general pacification process or possibly just inbreeding / outbreeding modifying the efficiency of the pacification process. – The Islamic conquest didn’t halt general pacification as it simply replaced the ruling elite. What it did was add the inbreeding component. If this basic idea has any relation to reality it would shows the potentially dramatic effect outbreeding had. also occurred in the high density agriculture parts of India, China and the Middle-east (not everywhere just those parts) but *much less steeply* over 5-6 millenia rather than 5-6 centuries. Only NW Europe? There wasn’t a gradual decline in homicide rates in central and southern Europe and Scandinavia? Even if not, those other parts of Europe now have homicide rates as low as NW Europe (as does Japan). If that happened suddenly in the last hundred or two hundred years in those countries, that would bring into doubt the idea that the 20th century English homicide rates were the result of 700 years of natural selection against genes for violence and murder (you wouldn’t need that to explain it if it happened elsewhere without it). 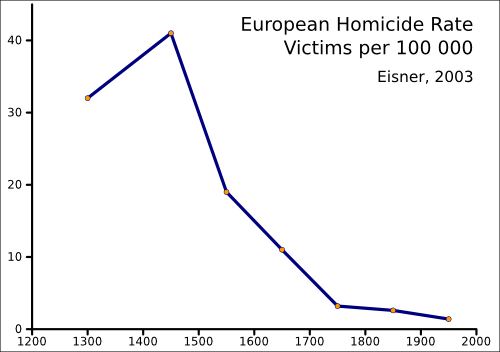 If the 700 year gradual decrease in homicide happened in those other parts of Europe, then it wasn’t only in NW Europe that it happened. @hbdchick Are you familiar with the Baldwin Effect (http://en.wikipedia.org/wiki/Baldwin_effect)? I came across it in Dennett. I’m in the process of reading BAoON right now, so don’t want to weigh in too much on your post, but if there is debate on timelines necessary for genetic selection to occur, I would say that conversation is incomplete without considering Baldwin effects.